On December 12, 2018, UE members from four locals in New Jersey (Local 155), Ohio (Local 716), Indiana and Illinois (Local 1177), and Nevada and California (Local 1077), ratified a new four-year national agreement with Hallcon which will provide wage increases of up to 20 percent over the term of the contract. This is the second master contract for the approximately 950 drivers. On the very same day the union ratified the contract, the National Labor Relations Board certified an August 2018 election for 650 Hallcon drivers in Colorado, New Mexico, Houston, Texas, Louisiana, Missouri, Wisconsin, Illinois and Indiana. The union is simultaneously working to implement the gains in the new contract and to prepare for wage bargaining in the newly-organized unit. Not only will drivers see a substantial increase to their take-home pay, the union was able to win a new night and weekend pay differential. This is especially important for road drivers who are on call 24 hours a day and may get a trip in the day or at night. It is very hard to have a consistent schedule. Drivers will receive an extra $.30 per hour between 9:00 pm and 6:00 am during the week, and for all weekend hours from 9:00 pm Friday to 6:00 am Monday. The union also increased pay for “busted trips” in the new contract. For example, road drivers could be dispatched for a trip at 2:00 am. A driver could get up, get ready, start driving to get to the pickup and then dispatch could call and cancel the trip. If the driver had not arrived at the pick up location, they would not receive show-up pay for the canceled trip. In the new contract, this busted trip will receive show-up pay, and the show-up pay will be 2.5 hours nationwide instead of the two hours drivers received in the old contract. The union made other gains: the meal period was expanded to 30 minutes paid nationwide. Also, drivers work in different cities, counties and states where there are different minimum wage laws that impact drivers differently. The union creatively proposed that when a driver drops off or picks up a crew in an area with a higher minimum wage (for example driving from San Bernardino, California to Los Angeles), that driver will be paid the higher minimum wage for the entire trip. “This will help our Ohio drivers that take trips into Chicago,” said Sam Foti, President of Local 716. Non-economic improvements in the new national contract include enhanced union rights, better shift and trip language, and expanded safety language. Stewards will now be paid for new employee orientation, and third-step grievance meetings will now be held within seven days from the grievance being filed at that step. The union was able to clarify and improve safety language — drivers can now refuse to drive unsafe vehicles as well as demand a safety inspection with a union steward to flag unsafe vehicles — and also how overtime is awarded and how open shifts are filled. Improvements to contract language for road board rotation, rest rules, and out-of-area work were also made. Negotiations were tense, and the bargaining committee had a strong multi-state contract support committee that got information out to coworkers about what was happening at the table. Union leadership brought the issues from the table to the workplace, and one action all four union locals took was to organize groups of drivers to hold up banners at rail yards around the country. The action told Hallcon, the railroads, and the general public that the poverty wages railcrew drivers were being paid were unacceptable. These banner actions created visibility for the union, prompted conversations in the yards and forced the railroads to put pressure on Hallcon to come up with a good deal. “After our action in September, when we came back to the table, it was clear the company knew about our bannering and that the railroad had contacted them. The next proposal from the company showed significant improvements to their economic proposal because they were afraid that we may escalate our actions,” said Larry Hopkins, President of Local 1177. Management used a classic boss tactic to attempt to divide the drivers: their economic proposal pitted senior drivers against new drivers. They did this by proposing to give drivers with 10 or more years of seniority half of the raise that other drivers in the area would receive. As usual, the boss can be the best organizer. Drivers were angry to learn that Hallcon does not care about seniority and in fact wanted to treat the more senior drivers worse than other drivers. The union fought this hard, and although the committee ultimately agreed to the lower raise for senior drivers, the union won language that senior drivers will always be paid $.30 above the highest paid non-senior driver in the area. This won the ten-or-more year drivers twice the raise the employer first proposed. “We were looking at half the raise in the first year, but we fought for this language, now drivers with 10 years or more are getting the same raise or more”, said Hopkins. Hallcon management also used the fact that this is a master contract with different locals and different states to try to divide the drivers. The union put forth a strong economic proposal with equal pay increases for all drivers across the board. The company proposed a plan to divide the workers: they wanted to give larger pay increases for California and Chicago and smaller increases to New Jersey and Ohio. The bargaining committee had tough conversations to come up with a plan to make pay more equal. The bargaining committee decided that California and Chicago would decrease their pay increase and give that extra money to Ohio and New Jersey. “After reviewing the company’s last, best and final offer, we knew it was not going to be acceptable in Ohio and New Jersey. Even though there are fewer members there, it doesn’t mean those members are less important. We worked together and came up with a counter proposal which the company liked. I’m glad that our contract was ratified and that we were able to unite across the company’s attempts to divide us.” said Ron Russell, bargaining committee member from Needles, California. “This was great solidarity on the part of the bargaining committee and shows that drivers care about each other across state lines and will make those tough decisions to ensure equality,” said Hopkins. Over 650 new drivers will join this master contract, increasing the union’s strength in numbers. The employer and union agreed that the 650 newly-organized drivers would automatically be included in the master contract. “We still have to fight for our wages, but we get to step up to a new, strong contract that our fellow UE drivers just fought for,” said Cheri Shaw, a new-unit bargaining committee member from La Junta, Colorado. Hallcon has agreed that the recently-organized drivers are recognized under the newly negotiated agreement, giving them a grievance procedure, road trip rotation rights, seniority for yard job bids and other advances. “We are ready to start holding the bosses accountable in Belen, New Mexico,” said Alisa Mastenbrook, bargaining committee member from Belen. The new UE drivers had been stuck in a company-dominated union, NPWU Local 707, for up to seven years. “We are ready to be in UE. We never saw or had calls returned by the 707. Now we are building our own local and taking it from there,” said Nandell Baines, a committee member from Houston, Texas. UE drivers are ready to work under this new contract and look forward to welcoming the new group of drivers from Texas, Louisiana, New Mexico, Colorado and Chicago. 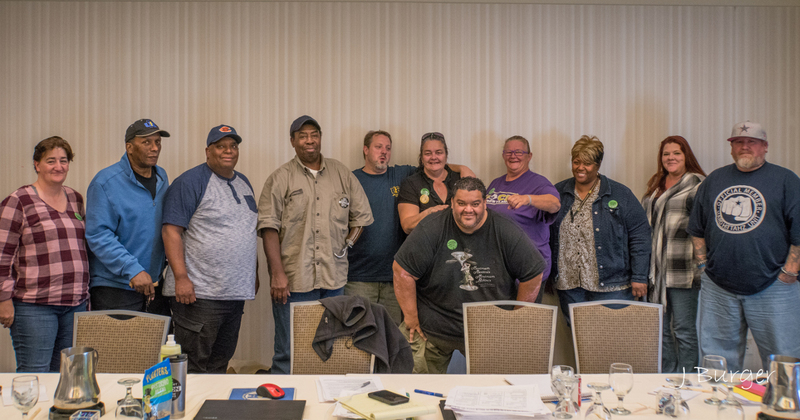 Bargaining was done by Laura Johnson, Ron Russell, Bobby Rivera, and Malissa Gollaher, Local 1077 (California and Nevada); Larry Hopkins and Clarence Hill, Local 1177 (Chicago Area and Galesburg); Sam Foti, Local 716 (Ohio); Johnny Bardge, Local 155 (New Jersey); Nandell Baines, Local 977 (Houston Texas); Alisa Mastenbrook and Cheri Shaw, Local 1477 (New Mexico and Colorado); and Steve Barrientes and Kevin Moore, Local 1177 (Illinois, Indiana and Wisconsin). They were assisted by Field Organizers Tara McCauley, Charlotte Bowman, and Fernando Ramirez and International Representative J Burger.